The lack of representation of some species in natural history collections may be due to some causes including: lack of a precise description of the location where type specimen was collected, change of name of locations, natural rarity of the species on the wild, lack of biological knowledge about the species, and habitat loss. These causes can hinder the collection of such species for research purposes. 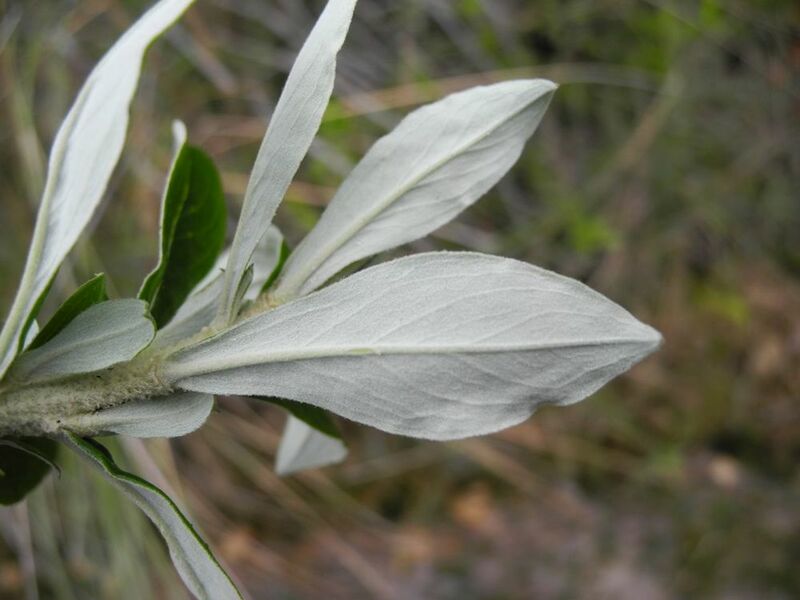 Over the last week I embarked in the search of three species of Diplostephium that have poor representations in the herbaria I have consulted, D. huertasii, D. jaramilloi and D. jenesanum. Following the records I wanted to collect those species in order to include them in my phylogeny for my dissertation. The fist species I was looking for was D. jenesanum, a species described in 2002 from a specimen collected on road towards a small town named Jenesano, Boyáca, Colombia. I was able to find a couple of other records from Ventaquemada and Villapinzón without specific localities. Thanks to google earth I was able to find a couple of roads crossing a small mountain between Villapinzon and Úmbita. 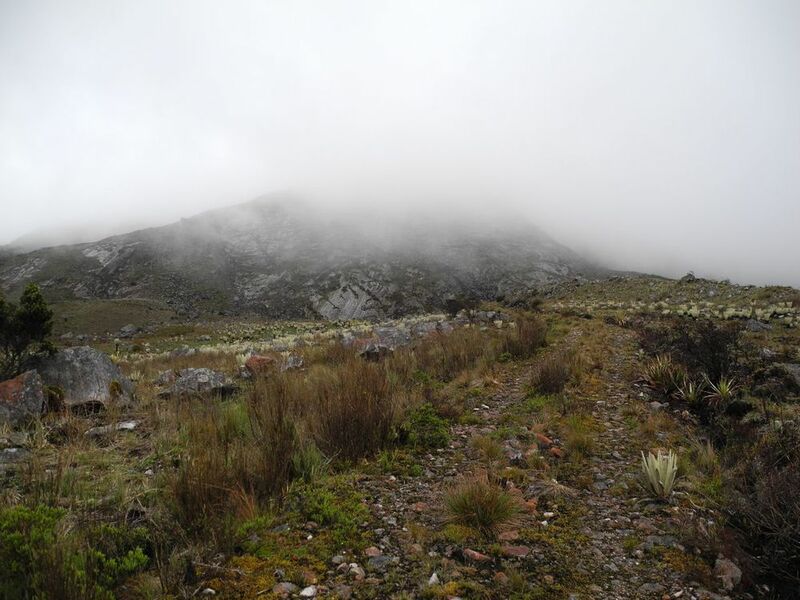 It turns out that one of these roads drives up to the head of the Bogotá river to the "Páramo of Guacheneque" where a healthy and protected population of D. jenesanum was found along with D. rosmarinifolium, D. juajibioyi subsp. leucopappum, D. floribundum, and D. phylicoides. North of this location I searched for D. jenesanum at its typical locality, unfortunately I was not able to find it, it was clear that the lost of habitat has almost clear out this species from the type location. "The Map" Lagoon, named for its resemblance with the Colombian map, head of Bogotá river, Páramo de Guacheneque, Cundinamarca, Colombia. The second species I devoted my search was Diplostephium huertasii; a species described originally from "The Paramo of Chingaza" and reported scarcerly with no more than two reports per department from Boyacá, Meta, and Cauca. As far as I know, the last time this species was collected was in 1981. Taking into account that I have look for this species several times at Chingaza, I decided to look for it in Boyacá. One of the two locations where the species has been found in Boyacá is a road that connects Sogamoso in the highlands with Yopal in the lowlands. The locations described a place named Vadohondo, both collections are kind of contradictory since they differ considerably in elevation. The first, made by Cuatrecasas, was close to the road at 2600 m while the second, made by Cleef, was on the mountain at 3600 with no specific reference of how to reach the exact collection spot. I started looking first for the location on the road asking locals for the name Vadohondo. Once I found the place, I walked around looking for the plant with no luck. After two hours of search, I decided to take a secondary road looking for places with less disturbance and more elevation trying to reach Cleef's collection site. On the secondary road I was able to spot a tertiary road that was abandoned but seemed promissory. I hicked the road upslope as fast as posible since it was already late. After one hour of hiking I was able to find one individual growing on the side of the path at 3300 m, the individual looked young and was not flowered. I decided to hike a little more to see if I was able to find more individuals and spot the habitat of the species. After a while, I ran into an abandoned house and a lagoon at about 3400 m, at that point I decided to go back to the car because I need it at least one hour of light to reach the car. I was satisfied with the collection, but I had the uneasy feeling of not finding the actual populations of D. huertasii. After returning to Bogotá, while checking the old records, I realized that the specimen collected by Cleef at 3600 m said the plant was common and use to grow on rocky places. It seems that D. huertasii like rocky places of high elevations something I was not able to confirm this time, but I hope to do it next time hiking even higher on that tertiary abandoned road. 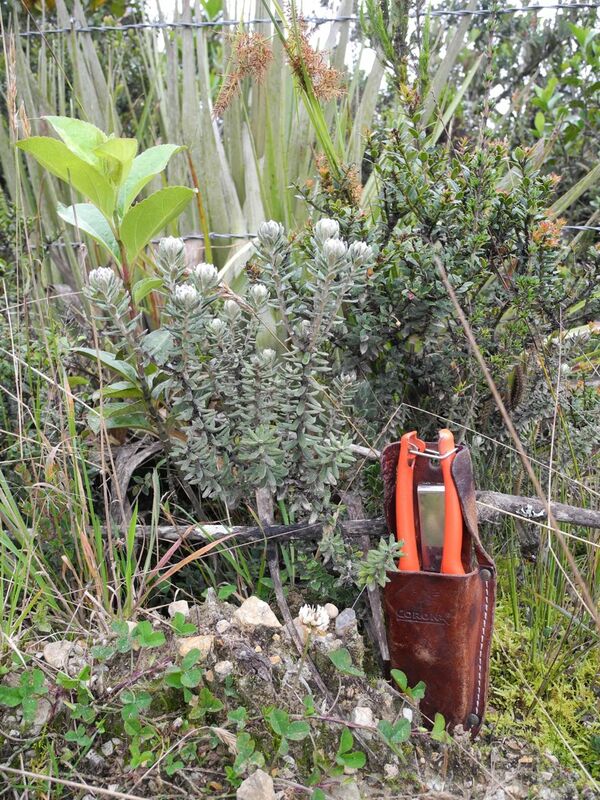 I know now that Cuatrecasas collection at 2600 m was atypical and does not represent the actual habitat of D. huertasii. The last species I was looking for was D. jaramilloi , a very similar species to D. huertasii. 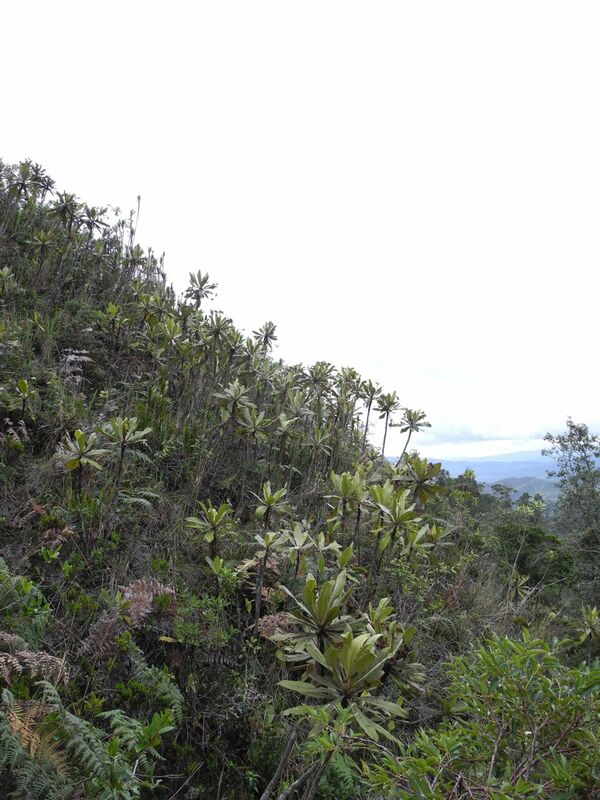 The only two records available from 1972 and 1973 cited a location between Arcabuco and La Palma in Boyacá Colombia between 2600 and 2900 m. The location was easy to find but not the plant. The road crosses and azonal paramo located at 2600 where I looked intensively for the plant without luck. Taking into account my last experience, I tried to look for roads or paths to reach higher altitudes. I had no luck, mostly all the land at this location is private owned and some has mining activity. Again, it seems to me that those collections represents individuals that were growing sporadically in these locations while the actual habitat could be higher on rocky climbs. At least now I have a better understanding of the distribution of the species and hopefully in the future I will be able to find out where the populations are growing.